Valentina Lisitsa’s vitriol: Nazi rhetoric or music to your ears? Many of Lisitsa’s talking points mimic RT’s skewed perspective, which suggests that the angry pianist’s mindset was most likely altered by the Russian media. 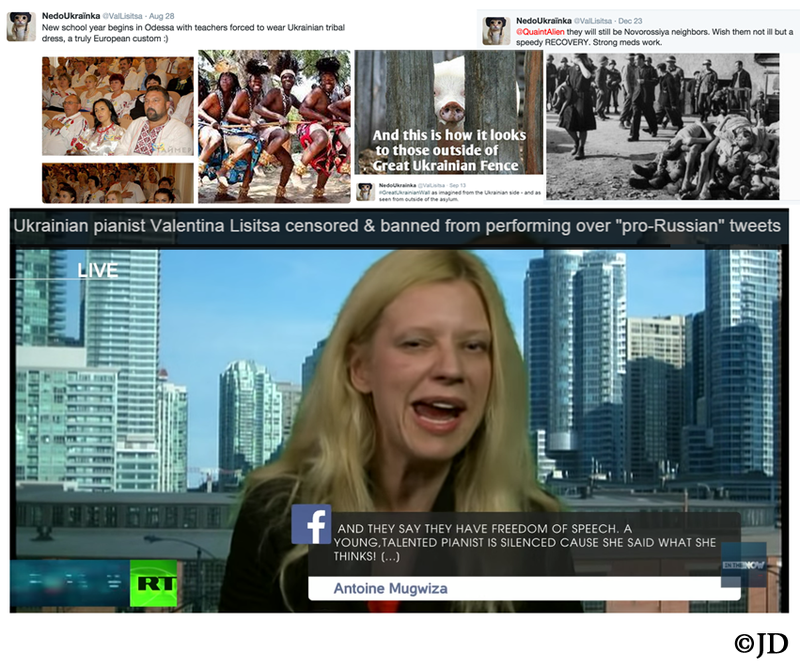 Let’s examine some of Lisitsa’s Tweets, eagerly adopted by RT as “pro-Russian” views. Valentina Lisitsa Tweeted: “Anonymous voter cri de coeur:”Torn limbs, headless bodies on streets. This is 21st century, Ukraine? Die, Nazi b*tch!”” Blaming Ukraine, a victim of Russian aggression, for the casualties caused by Putin’s invading pawns, is extremely offensive. Echoing disturbing commentary that wants an entire country “to die” is also very disturbing. In other Tweets, Lisitsa supports Russia’s pet project (“Novorossiya”) and thereby condones expansionism of the Russian Federation, heavily promoted by Vladimir Putin. Nazism is a form of socialism, featuring great disrespect for another nation’s culture, intelligence, and respectability, racism, expansionism and obedience to a strong leader. While she verbally decries Nazism, Lisitsa’s own Tweets carry strong characteristics of the very ideology she claims to oppose. Valentina Lisitsa Tweeted: “This is better: Dear informed Ukrainians! I will never get tired of reminding you that you are dog sh*t. Thank you for attention.” Denigrating people of any nation with this type of hate speech is extremely offensive. When viewed in combination with Lisitsa’s other social media postings, this Tweet paints a clear picture of her extreme hatred towards Ukrainians. Valentina Lisitsa Tweeted: “New school year begins in Odessa with teachers forced to wear Ukrainian tribal dress, a truly European custom :)” She proceeds to include photos of African villagers, side by side with photos of Ukrainian teachers in their traditional national attire. This comparison is clearly intended to be derogatory, implying that Ukrainians aren’t worthy of joining Europe. This kind of disrespect towards other nationalities, races and their cultural expression, clearly falls in with the approach for which the Nazis were infamous. Valentina Lisitsa Tweeted a picture of the bodies of people murdered at the Buchenwald concentration camp, accompanied by the following text: “They will still be Novorossiya neighbors. Wish them not ill, but a speedy RECOVERY. Strong meds work.” The vile content of the said message is self-explanatory and also falls in line with Nazi ideology. It demonstrates the gross disrespect for Ukraine and the lives of its people, as well as support for Russia’s expansionism. “Novorossiya” is an archaic term that was resurrected by Vladimir Putin in 2014, as a flashback to Russia’s imperialistic conquests during centuries past and a prime example of Orwell’s newspeak. Valentina Lisitsa happily gloated, believing that Ukrainians would freeze in cold weather without Russian gas. She compared Ukraine to hell, posted crude cartoons mocking lack of heating andintroduced more images of pigs that she is so fond of using when discussing Ukraine. Lisitsa Tweeted: “In a new, European, Ukraine the camps will give their subhumans condemned to gas chambers an opportunity to offset their carbon footprint.” The influence of Nazi ideology is clearly present in these deeply offensive postings. Valentina Lisitsa posted commentary suggesting that “Banderites” should be burned instead of coal for heating purposes. She appears to be very preocuppied with the idea of concentration camps, falsely claiming that they’re being built in Ukraine. Lisitsa decided to taunt Garry Kasparov, former World Chess Champion and a staunch opponent of Putin. She Tweeted: “Kasparov needs to be reminded that his adorable Western democracies enthusiastically deported his people to gas chambers…” Blatant falsehoods are seemlessly intertwined with Nazi ideology in these postings. The extensive collection of Lisitsa’s anti-Ukrainian Tweets contains obscene sexual scenarios, revolting graphics, comparisons of Ukrainians to people with Down Syndrome, rejoicing about the deaths of Ukrainian soldiers in Debaltseve, overt support for Russian terrorists in Ukraine, the use of derogatory slurs to demean Ukrainians and intentional falsehoods about alleged “organ harvesting,” besmerching the reputation of Nadezhda Savchenko, who was kidnapped and is now illegally imprisoned in Russia. Perhaps the worst indicator of Lisitsa’s mentality is that she never apologized for any of her revolting postings. In sharp contrast to Mel Gibson (whose prominence is by no means being equated to that of a YouTube pianist), Lisitsa’s refusal to accept responsibility for her public statements speaks volumes. Gibson used his right to free speech to apologize for his offensive remarks. Lisitsa is using her voice to perpetuate unrepentant hatred. Her odious hate speech remains unimpeded, in spite of her hollow claims of “censorship.” No regulator or government agency required Lisitsa to delete or modify any of her postings. The arts community is also free to choose whether or not to associate with the individuals like Lisitsa, once they become aware of her racist, discriminatory and highly abominable views.